The Questions You've Wanted To Know-Answered! This wasn't an interview with a person, I came up with the questions, actually. Based upon my experience with what people seem to want to know more about. Do you use a camera to take your pictures? Yeah right, half of the pictures on the website wouldn't exist if I did that, and the remaining half would be glared and blurry. Name something hard about taking pictures for the gallery. One hard part is getting pictures that are in those fast-moving shots (which most of the time are the best ones) at the exact right time, even if they only last 1/10 of a second. Name something else hard about taking pictures for the gallery. Sometimes I have just the opposite problem, and I have multiple shots to choose from for one scene, and I have to pick which one is the best to use. Usually they are either all great and you can't go wrong or it's an obvious choice, but the former usually makes it tough. What was the toughest shot you ever had to get? This one is new, actually. Serena is getting hit in the face with a beach ball, as you can see. As you can imagine, Raye has a pretty tough serve, so the ball moved incredibly quickly. The image you see here had to have lasted at the most 1/5 of a second, which meant that's how long I had to get the shot. What is your favorite picture you've taken? That is literally one of the most impossible questions I've ever been asked (well, next to the questions on Ms. Day's Humanities exams). After grueling thought, I've decided on this one because I am a strong disbeliever in ties. It's really beautiful and it totally captures Serena and Darien's love for each other. It's also one of the first pictures I took for the site so I have a sentimental attachment to it. What do you like about running the website? It's incredibly rewarding to see the finishing product. Even if nobody sees what I've worked on, or if I don't know any of the people who have been visiting, I see it, and my final product is the satisfaction from seeing the fruits of my hard labor pay off. What do you dislike about running the website? It's a LOT of work! It takes so much time and energy to run all the different parts of the site I have come up with on a regular basis. I set the bar so high I can barely keep up with it half the time. It drives me nuts, but like I said, it's extremely rewarding. And once I have one part finished, I get to stop worrying and move on to the next newest thing. It's a never-ending cycle. If you could finish one part of the site immediately, what would it be? The episode guides have been my other pride and joy, they are extremely useful in my opinion, but are SUPER hard to do because they require me to watch the episode (usually, sometimes I can read another summary and collect my memory of that episode from there) and since there are a lot of episodes to begin with, it won't be a while till it's done, so I'd love for that load to be off my back. Definitely Serena. She and I have so much in common, it's almost scary. That's a tough one. 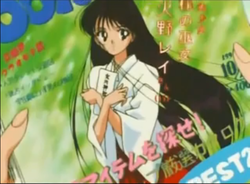 I would probably say the episode where Nephrite dies, because even though his relationship with Molly seems kind of pedo, it was sad to see how heartbroken she was. And yes, I did cry at the end.